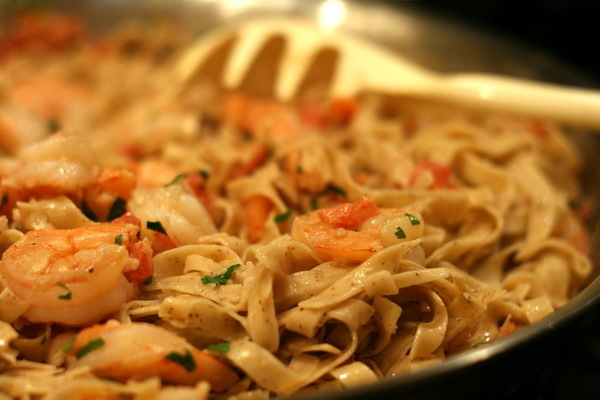 This quick cream sauce can be used on just about any pasta dish – added to the flavored fettuccine from FiberGourmet and topped with sauted shrimp – mmmm, mmmmm good ! Cook pasta according to package instructions. Melt butter and sauté shallots 4 minutes then add garlic and cook 2 minutes more. Add shrimp to skillet and sprinkle with spices and cook until shrimp is just about done. Add tomatoes , parsley and basil and cook another minute. Then add half and half and keep warm on low temperature. Pour over pasta and serve immediately. Regular bell peppers will do fine here, but I often like to mix in fryers, and special varieties that you find at farmer’s markets. 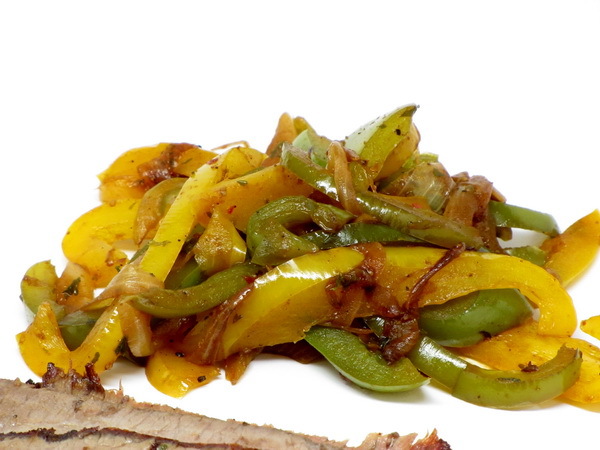 At the very least, I try to mix colors of the store bought peppers to make this a colorful dish. At only 38 calories per serving (which is a WHOLE pepper and ¼ of an onion), don’t be afraid to have an extra portion ! This is great next to steak and even next to hot sandwiches. This is one of my favorite dishes at Italian restaurants. 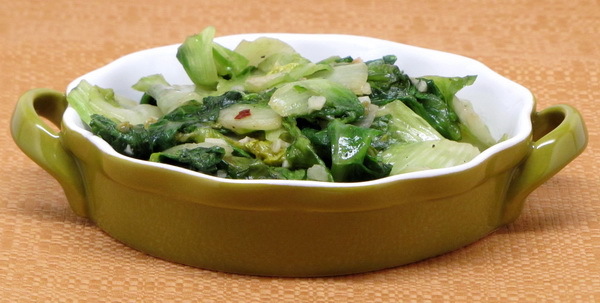 It may seem like a lot of escarole to start, but it cooks down a TON. My version is the super garlic version – feel free to tone it down by using half the recommended garlic ! Heat the oil in a large skillet on medium high. 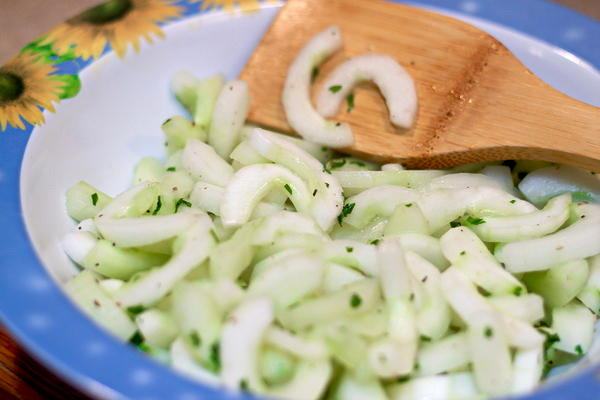 Add minced garlic and saute for 1 minute, stirring constantly so that the garlic does not burn and get bitter. Add escarole a few handfuls at a time and mix every 30 seconds or so making sure all escarole comes in contact with the bottom of the pan so it heats and wilts. Once wilted a bit, add salt, pepper, garlic powder and red pepper flakes. Continue cooking 5 minutes or until to desired doneness. You can take it off while there is still some crunch to the larger pieces, or I like to cook it all down quite a bit and serve it very wilted and cooked. This literally takes 5 minutes to cook and just a couple to prepare, especially if you have a handy dandy garlic chopper. 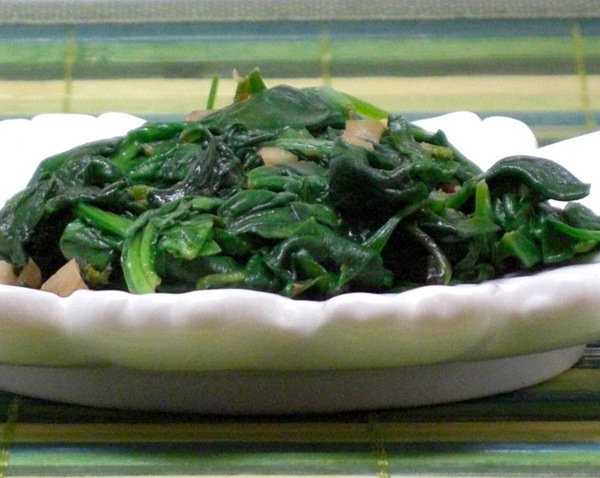 The spinach wilts in no time and you can make this as mild or as spicy as you wish by adjusting the amount of red pepper flakes. 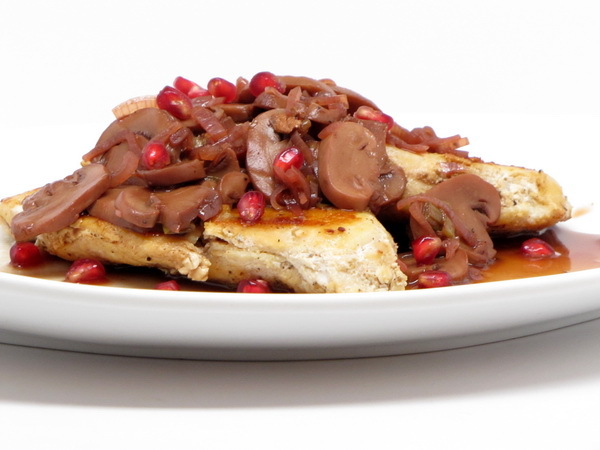 Serve with Rice and Pasta with Parmesan Cheese and Crock Pot 20 Clove Chicken for a great complete meal under 400 calories. Heat the Pam and oil in a large skillet. Stir in minced garlic and sauté a minute or two on medium heat. Do not let the garlic brown or it will taste bitter. Pour in the 2 bags of spinach. It seems like a HUGE amount, but it will cook down to nothing in no time. Add all the spices and continue to sauté on medium heat, 2-3 minutes or until leaves are all wilted.